Paul Ryan’s vague and carefully crafted Medicare message aims to please all the groups that Mitt Romney needs to win. Paul Ryan’s successfully vague campaign to promise “current seniors” the moon. 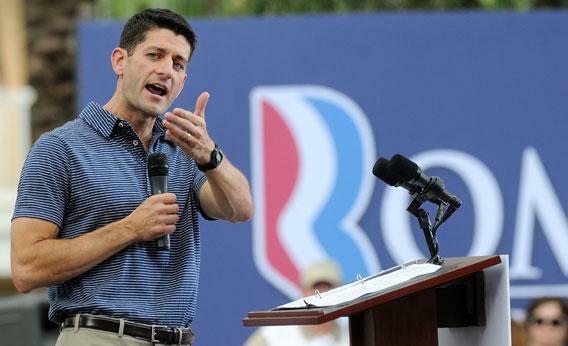 Republican vice presidential candidate Paul Ryan speaks on Aug. 18 in The Villages, Fla.
Photo by Gerardo Mora/Getty Images. One of the pure joys of campaign reporting is the “headlines” e-mail. When a candidate has a particularly good day—a killer debate, a speech that goes off with no falling lights or flags—journalists get a missive from the campaign that runs through the bedazzled takes of your peers. The subtext is this: Why haven’t you written your story about how fantastic we’re doing? On Saturday, shortly after Rep. Paul Ryan spoke at The Villages in Florida, the Romney campaign sent out no fewer than 14 incredible headlines. “Nothing but Cheers for Paul Ryan’s Medicare Plan at The Villages,” reported the Tampa Bay Times. (The planned community, where souped-up golf carts dominate the roads, is a Republican stronghold.) “Ryan Campaigns With Mother, Vows To Protect Medicare for Seniors,” reported the Hill. It just depends what the meaning of this is. To keep on winning the Medicare debate, Ryan needs to please three groups of people. They are: conservative voters who are fine with any Medicare scale-back, conservatives who are fine with any Medicare reforms that don’t affect them, and swing voters who aren’t sure what they want. The campaign has moved on now, and our cable chyrons and Web leads have been given over to Todd Akin. Look back at Week 1, though, and Ryan’s done a stellar job pleasing all parties. What do we know about the anti-Medicare conservatives? They are not numerous, but they exist. On Friday, right before Ryan flew to Florida, I saw him speak for 20 minutes in Springfield, Va. Before he got there—actually, before a road show that included black Democrat turned Republican Artur Davis and unsuccessful Obamacare-slayer Ken Cuccinelli—I polled Ryan fans on what they wanted to happen with Medicare. The “just end it already” crowd skewed young and talked plain. More numerous: the “Medicare for me, then no more” types. They were older. King Dietrich, 54, is just old enough to make it into the new “premium support” program if Romney-Ryan won and implemented the budget chairman’s plan. “If I understand the Ryan plan correctly,” he said, “I’ll have an option by the time I get there, whether I want traditional Medicare or whether I want a voucher.” Pat Tilleny, who would only say politely that she was in her 60s, was confident that Romney and Ryan wouldn’t really end the Medicare program. One reason, she said, was that “Ann Romney has MS.” Clearly, the GOP ticket was going to look out for people. When Dietrich said that, I heard an echo of an old Tea Party argument from 2010. It was a seven-word slogan that made liberals guffaw: “Get your government hands off my Medicare.” As my old colleague Tim Noah pointed out, this was a newly popular version of an old, odd myth—that Medicare wasn’t really a government program. Government programs were unsatisfying and ineffective. Medicare worked. Surely, it was better than a government program. It’s solid campaign patter. Ryan alternates between the specific, like when the plans would switch over, and the vague. He’ll keep “the promise” of Medicare, which is different than keeping Medicare as it is. He’ll keep a “guarantee” of coverage, which is different than keeping it a full-coverage entitlement. I don’t see anyone who’s already inclined to vote Republican having a problem with this. And those swing voters? They’ve got to be reading the pretty headlines.